Every so often there is a game; a game that is simple, repetitive, and yet with that limited concept is truly fun. Amorphous+ is one of those games! Amorphous+ does not have the “awesome” graphics, it does not have a rich deep story line, and it does not have a “blow you away” combo system. But yet, without all that, it manages to get you to play it, and continue to play it. And enjoy playing it. Why? Simple and yet highly enjoyable gameplay, if there was a game that could sure you why gameplay makes the game, not graphics, or music, or shock value, Amorphous+ would by the top of the list. 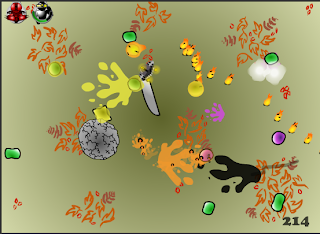 Now let’s talk about the game itself: Basically you play a guy with a sword in a little game area, and you attack little things named “Glooples” (Most of which look like blobs of jelly). You have three modes to choose from: Practice, Single Nest, and Bounty Run; practice is as it sounds. Single Nest is where you take on a set amount of enemies. Bounty Run is, basically, play until you die, the game’s true high score mode. Games start off easy and get progressively hard the longer you play (You can tweak how quickly a bit through the games many difficulty settings). This all goes back to why does the game get such positive responses’ from players; it had a rating well over 4 before it got badges and a card challenge, and seems to still have a rating over 4. Maybe it’s the in-game achievement system, maybe it’s all the music in the game? I’m not sure, but what I can tell you is, even though I am playing the game mostly for badges, I enjoy playing it; I want to play it as I’m writing this right now….. Okay I just played it again for 20 minutes, got frustrated by dying coursed out the game, and now as I’m writing this next sentence already want to play it again! I have heard a few people say the game is boring and ask “what do people see in this game” No one can be truly sure, but I think it’s that that game requires very little thought, and is in an odd way pretty relaxing. You can just zone out and mindlessly kill these very cartoony evil creatures, and getting a better score becomes somewhat addicting. Not the bread and butter of the game, but it doesn’t need to be. They aren’t bad though; you get all the “splatter” effects when you kill a gloople. The animations are also pretty good (even though it somewhat looks like your guy swings his sword with moving his arms!) but they aren’t top notch. So I’m giving it a 7, better then a lot of games, but not quite at the premier level. The sound is very nice; you have all the effects you could hope for and more. You also have 11 (What I counted) songs in the game. How this game is under 10 MBs I have no idea! Most of the songs are very “sim city ish” which don’t really fit in the game, but I’m not going to complain. Has everything you could want, and Greg even says this is one of the best implementations of the API he has seen in a while. Only a few little glitches like you kill a gloople and its “killer juice” splats on you instead of away from you. Other than a few situations like that there’s no problems. What can I say, the game is addicting, fun, last able, and has no real weak areas. The beauty is in the simplicity. Any game that can get players to want to play it as long as Amorphous+ can, has done most everything right.